This quilt is an original design showing three beautiful Black women. The faces are made with suede and it features jewelry and real hair extensions incased in tulle. There is also hair couched around the hair lines of each lady. This quilt is an originally designed piece, depicting an Afro-Cuban dancing goddess superimposed on colorful background. It features 3-dimensional beading and fabric braiding. CREA (The Charitable Raffle Enabling Act) defines a raffle as "the award of one or more prizes by chance at a single occasion among a single pool or group of persons who have paid or promised a thing of value for a ticket that represents a chance to win a prize." Item: This raffle is for a Quilt donated by aclaimed quilt-maker Barbara Ann McGraw celebrating the amazing proprieties set by black entertainers of a glorious but arduous past, and aptly named "The Entertainers". Price: The sale of the tickets at a donation of $50.00 per ticket will be held with the legal accompaniment of Advocate Harry Eaddy (hereinafter: "the Supervisor" / "the Raffle Holder"). Count: Only 150 tickets will be sold online, so be prudent and purchase quickly. Age: Participation in the Raffle is for adults over the age of 18 only. Ticket sales will take place G-d willing as of December 6, 2018 at 19:00 until January 21 at 12:00 a.m. midnight (hereinafter: "the Sale/ Raffle Period"). The Raffle is open to all friends and supporters of the DAAS, who will donate to the DAAS (hereinafter: "Participant" or "Friends of the DAAS" or "Friend"). The Participant and/or one who wishes to participate in the Raffle agrees, confirms and declares through his participation that he has read the Rules and he accepts its provisions. Black film has also been a part of my life since childhood. We were drawn to the television like a magnet when a black person was on the screen ... [For this quilt] Many hours were spent watching old films and doing research before starting on this quilt ... 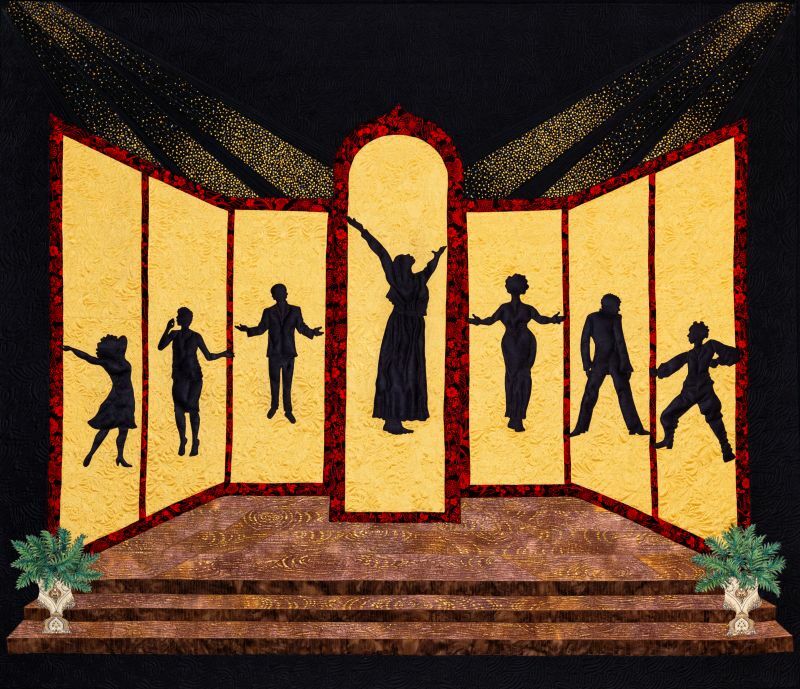 I decided to make a similar stage, but using black suede silhouettes of Black actors, singers and dancers demonstrating their craft. The stage shows the shiny, polished boards of a theater floor, and the beams of stage lights radiate from above ... And now, as the last stitch has been sewn, I present to you, "The Entertainers". How wonderful they were, how amazingly hard they must have worked, and what challenges they must have faced for the often meager opportunities they were given. I put myself in their places; the "Coloreds Only" restaurants and bathrooms, the bad names they were called. I understand that it was the price they had to pay to realize their dreams. Those brave artists paved the way for those who came after, a chance to dream. The goal of the Denton African American Scholarship Foundation is to make college a reality for youth of African American descent. Because of continued reductions in state funding, many colleges and universities are forced to increase tuition costs. These increases are frequent and can range from 2% to 5% each semester. Scholarships are awarded at a joint "Celebrating Scholarship" program hosted by the Scholarship Committee and the Denton African American Scholarship Foundation. Presented by the Denton African American Scholarship Foundation, the Denton Black Film Festival brings together some of the best artistic showcases of Black storytelling. Built around amazing cinema, the festival is unique from many others in that it also features music, spoken word/poetry, art and more. The event shares these stories - including traditions, ideas and experiences - in a multitude of ways, and as a way of bringing the African-American experience to life and allowing guests to experience Black culture in an immersive and engaging way. You bring curricular concepts and creative experiences to life for dozens of students by your immersive example visiting film festivals and buying tickets in raffles. The Denton AASF partners in innovative ways with other museums, universities, schools, and individuals to create lasting impact for scholarships. The financial burden of dozens of students will be reduced or eliminated by your generous contribution through auction bids or donations. Through combining efforts with endeavors such as the Denton Black Fim Festival, students engage in hands-on activities and adopt exciting new practices. Buying Raffle Tickets make scholarship dreams come true.